Col Chris Woodbridge, USMC (ret) is the Editor & Publisher of the Marine Corps Gazette, he joined ALL MARINE RADIO to discuss the challenges ahead for the Marine Corps in the realm of Mission and changes in the mentality and culture that recruits come from and live in. 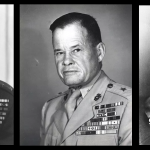 We also discuss the exciting news that the Marine Corps is digitizing its historical audio collection and that it will soon be available online via the Historical Division and the Gazette! GREAT NEWS!! !